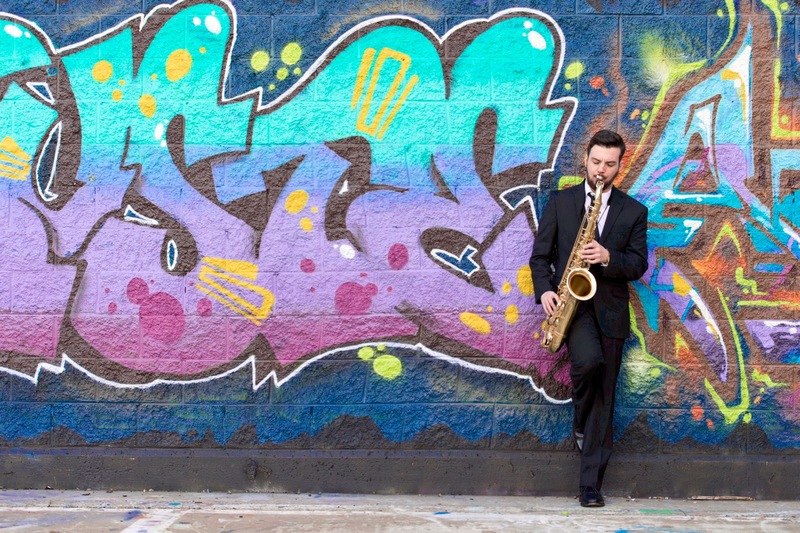 Mike Casey has been making waves in the jazz scene for some time now and his new album ‘ The Sound Of Surprise: Live at The Side Door’ is a gem. Recorded live in one of Mike’s favourite venues, in Connecticut, the CD captures the effervescence of Mike’s talent – and that of his trio. ‘Hydraulics’ opens the CD with a strong, stomping drums and bass conversation into which the sax of Mike Casey inserts itself almost rudely but also exquisitely. Mike has that loose-reeded methodology which is at once laid back yet intense and his expression is rich and deeply textured. ‘Hydraulics’ , penned by the trio’s percussionist, Corey Garcia, is the perfect vehicle for the way Casey plays with loud bursts contrasting with quiet little interludes, sometimes sounding like he is off in his own world of wonder and at others coming back to engage and react to the musicians who support his playing so well. ‘Turnaround’ is crazy – in a good way. This lifts and brings smiles a plenty with the quirky interaction between the musicians. Mike’s sax takes the role of the go-between, creating linking passages for the musicians who offer dissonant sounds, chirrups, twitters, tweaks and scrapes before Mike sets a theme, restoring order and taking the piece into a bluesy solo under which the bass sets up a contrapuntal rhythm which gets its own clap from the intrigued audience at this live recording. The piece is clever and varied. Theoretically, it should challenge the listener because there is off-beat rhythm, odd inserts in the introduction and an eclectic gathering of subtleties, introduced by the individuals and yet it is so easy to listen to because it is held together both by the sax overplaying and the wonderful, strong bass lines imposed by Matt Dwonszyk. The sax introduces insistent themes this works to create harmony and colour. Excellent. Casey’s self penned ‘Dagobah’ develops from a quiet and gentle introduction into a classy number with Casey’s strong, boppy sax overflowing with intonation and he shapes the piece like a potter at the wheel. Under the sax playing is a racy rhythm, almost impetuous at times, serving to emphasise the fluidity of Casey’s sax work with its off-beats and sheer cheek. Casey works the theme to include a change of emphasis which leads to an Eastern feel before a section with just the percussion of Corey Garcia before the bass and then the sax join him, the theme being developed once more. ’Heartbreak’ is a delicious number, set over a continual bass line. The sax flows up and down, pitching, rolling and generally painting colours with the tone and expression. Mike does his ‘set a theme and then change it’ thing- which is something of a trademark I am coming to understand – and the whole thing chops and changes, first fast, then slow,slow,slow and then a change of pace before the theme alters again. And again, the band do that thing where on paper this should make listening difficult, it is not, it is absolutely fine and easy on the ear because the changes are slick and picked up so easily by the musicians and shared with the listener. The whole structure flows easily from one change to another – glorious. The electric connections between the trio is very apparent and infectious. I am betting live ( as this was recorded) is very much an interactive experience with this trio. On his influences Casey comments, ”I’ll never forget hearing Sonny Rollins for the first time in middle school. His sound, melody, the rhythm, hearing every idea connect so clearly in dozens of ways. Then I came across ‘Freedom Suite’ and my concept and goals changed drastically. I was inspired and challenged. The search was on. I wanted to see how much I could do without chords, instead focusing on rhythm and melody above all,” On the title, he says, “One of the musical concepts I love the most is the sound of surprise. We love to surprise our audiences – and each other! We find that we create the best music when we reach beyond what we think we can do.” Well, I have to add a caveat – this trio surprise in all the right ways, their music is sound, solid, has great references and yet is very strongly unique. A great CD and really good jazz music. Simples.